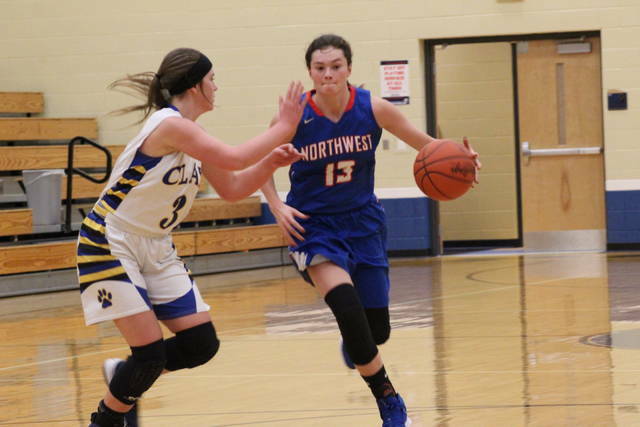 Northwest sophomore Haidyn Wamsley led the Mohawks with a game high 13 points in their road win over Clay on Monday. PORTSMOUTH – What does it take to pick up a quality road non-conference win? An incredibly solid performance from all of your rotation players with just two weeks left in the regular season. That’s exactly what the Northwest Mohawks (8-11, 2-9 SOC II) were able to do Monday night over the SOC I’s Clay Panthers (12-6, 8-2 SOC I) in a 43-33 win on the Panthers home court. Northwest did exactly what Frantz wanted them to do, executing his game plan to a tee. The Mohawks were able to swarm to the ball on the defensive end, get out in transition after defensive rebounds and forced turnovers, and hit their open shots when they needed to. Wamsley only being a sophomore is one of the biggest surprises when watching the Mohawks. The do it all attitude she has translates on the defensive end as Frantz mentioned, but also on the offensive end where she had a game high 13 points in the Northwest victory. Another player that was impressive for the young Mohawks was sophomore Val Eury who finished with 11, all of which came in the first half. Northwest’s highest lead of the game came in the early third quarter when they held a 32-17 advantage over Clay. Despite the Panthers best efforts and outscoring the Mohawks 16-11 over the last quarter and a half, Northwest came away with a ten point road win over the second place team in the SOC I. With two wins in three days, (Saturday at Eastern Pike), Northwest is trending in the positive direction towards the .500 mark. Yet, with games still to play against three of the top five teams in the SOC II, there are still challenges that lie ahead for Frantz’ bunch. Clay was led in scoring by Cam DeLotell who finished with a team high 11 points, nine of which came from behind the arc. With the seeding for sectionals and district tournaments happening this Saturday, Frantz is hoping his team can learn from their back to back road wins by continuing to progress as tournament time approaches. https://www.portsmouth-dailytimes.com/wp-content/uploads/sites/28/2019/01/web1_IMG_8455-Copy.jpgNorthwest sophomore Haidyn Wamsley led the Mohawks with a game high 13 points in their road win over Clay on Monday.